You can format CDA Special Instructions to show bolding, italics, line-breaks, links, lists, etc. using markdown formatting. Markdown is an easy way of formatting plain text so that it can be rendered in a richer visual style by software such as Paperless Pipeline while still being human readable. Go to the desired location, click the gear, and select “Commission and CDA Settings”. Scroll down to the “CDA Instructions” section. You can enter markdown-formatted text into the “CDA instructions (to be shown above Payables)” and “CDA instructions (to be shown below Payables)” fields. Enter your text and markdown, then click [Save Settings] to complete the process. 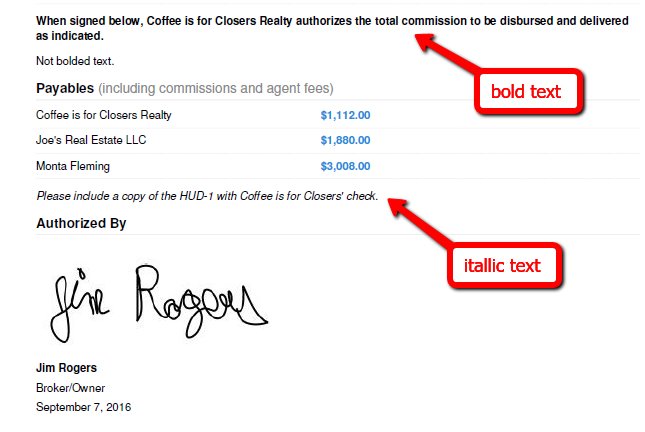 Text surrounded by asterisks or underscores will appear in italics. This text: *asterisks* or _underscores_. Will appear like this: asterisks or underscores. Text surrounded by double asterisks or double underscores will appear in bold. This text: **asterisks** or double __underscores__. Will appear like this: asterisks or double underscores. Just hit <Enter> a couple of times to separate one block of text from another i.e. to create paragraphs as you would do naturally.